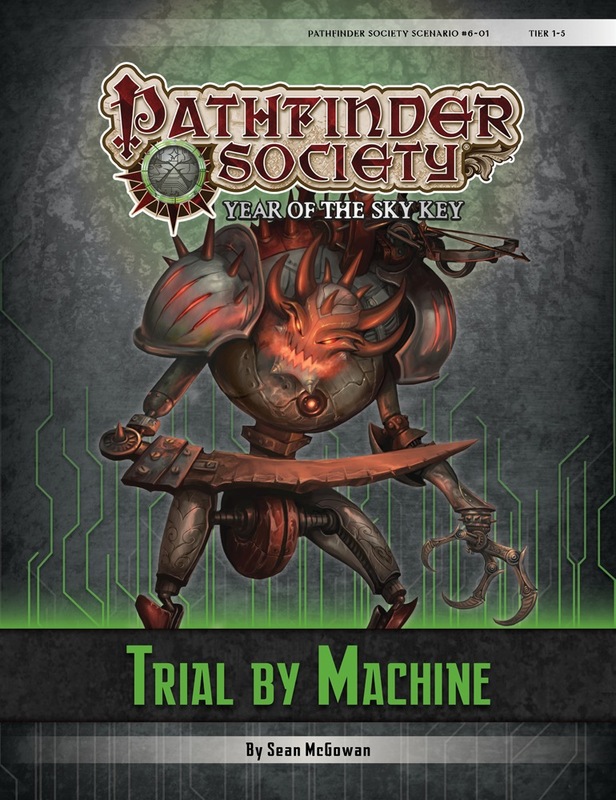 More than a millennium has passed since the "machine mage" Karamoss's failed siege of Absalom, and for years the Pathfinder Society has used upper reaches of his subterranean siege tower as a training ground for initiates. During a routine drill, the once-dormant dungeon springs to life, and it will take all the PCs' resourcefulness and skill to make it out alive. It is one of my favorites, it's not overkill but its not a push over plenty of role playing and the loot is great. both tiers are meaty enough to challenge and the checks are tough enough that it warrants party cooperation. Tech scenarios are always a big hit-or-miss kind of thing. Not everyone loves tech mixed with fantasy, while other do enjoy it. I myself am part of this second group. As long as it’s not too advanced, I can certainly enjoy it. The storyline of this scenario is straight forward: go to A for an obstacle course, but obviously turns into something more. I liked the transition, though I felt that storywise it was a bit too forced. I mean, rolling knowledge checks and then learning about bandits when it’s just an obstacle course is too much information from the start. The fights and tech were amusing, but not overly hard for the 2 alchemists, bard and wand-crazy rogue. Sure, we took some hits, but our strategy and teamwork carried us through and we were laughing the entire time. However, if I were to nitpick, the story wasn’t as great as those of other tech-scenarios and it just didn’t leave the same impression. At times the encounters felt a bit too random and out of nowhere. My conclusion is that this is a decent scenario, but not overly exciting. It’s also not something everyone will enjoy and as such I can’t really recommend it. I’d rather recommend other tech-scenarios. Compare to Fire of Karamoss and Return to Sky, just a bit of pale and boring. As a non-tech-fan, the setting and mechanics are okay, but the social and investigation parts can't catch my eye, the only intersting point may be some tech-items that you can't buy in average PFS games. The BBEG is deadly for tier 1-2 characters, but if the whole team can handel with the "gaze" attack, would be a little easy though. Entertaining, but not highly recommeded except you really prefer tech-adventures. Wasn't sure what to expect with Season 6, and was happy that this balanced out 'tech' and 'fantasy'. Overall a pretty routine scenario with a few new tech additions, was fun enough and worth picking up. This sounds like a really nasty version of The Confirmation. "Oops, sorry guys. I started the machine somehow. If you make it out alive, consider yourself field agents." As long as they all do not have harness 8/10, my summoner's eidolon will have a field day in there. So based on the Faction letters, this one is going to build off the Silver Crusade story for season 6? This product description is missing the Author name. It's in the picture though. This was pretty rough one with 4 level 1 players. Still not sure about this technology stuff being introduced into PFS. Debating as to whether I will be doing any more of the season six scenarios. You realize they explicitly said that a lot of Season Six scenarios has nothing to do with technology, right? This scenario was full of it. Just about every battle was against some form of machine. Some season 5 scenarios were full of demons. Others didn't have a single one. That is True. I just am not a real big fan of the technology flavor I guess. Still on the fence about it all. I personally have no problem with it and look forward to the experience. However, I totally support your desire to only play the non-tech scenarios this season. Hopefully they will be obvious in which scenarios are more traditional than others. I am going to give it at least one more try. Maybe it will get better or there will be something that changes my mind about the whole thing. I typically print the maps at scale for the scenarios when possible. I use Gimp to do some scaling and chopping. All the maps for this scenario just copy over as black blocks. This is the first time I've had this problem with a Paizo PDF. Anyone else seeing this? It's going to be a serious pain if I can't print the maps. I was having the same problem, but Nitro PDF Reader got the images out for me. Yikes $140 is steep. I'll give the 14 day trial a shot but it won't be a long term solution. I was able to get the maps out by loading the PDF into gimp instead of copy/paste. Now the issue is that these maps have the trap and room ID marks embedded into the image. Most current Paizo maps have them on a different layer so when you copy and paste them over the markings don't copy. Very convenient. This will mean more editing to fuzz out the secret parts. I'm just using the free version. I agree that $140 seems steep, which is why I'm not using that version. This was confirmed in play. Our table on Sunday at GenCon consisted of a L2 Alchemist, a L2 Slayer, and four L1 pregen (Bard, Cleric, Rogue, Warrior). We barely squeaked through the first fight, managed to parlay with the raiders, and were nearly TPK'd with just the first two npcs with auras. Given a lack of resources after defeating *one* (we closed the door and had not entered the room) we high-tailed it out of there (like intelligent explorers would and should do) requesting additional resources or means to handle that situation and we were informed that we should have 'kept going'. End of Module. There was no way for us to handle that room with the resources on hand. This is a potentially bad PR situation for folks who want to play in PFS games, have sat down to this for their first game, and run into this. As it is, there may be four players (A family--Husband, wife, two children--the folks using the pregen characters) who were a bit put off by how the module ended. What's more important is... can this be adjusted somewhat with an errata sheet or the like to make it a bit more survivable for that sort of situation while maintaining a level of challenge and fair play? It won't make a difference to me, I've played it, got a handful of coins and a prestige for my character (far better than the unattainable res costs @L2, of course). If there was some way to offer suggestions on how to improve this, I'm willing to submit a more in-depth idea on how this could be adjusted while still maintaining lethality potential. I GMed a lot of slots for Gen Con 2014, but this was the only PFS adventure I got to actually play at the convention. I am a long-tenured veteran of PFS modules, and I have to say that this one is quite challenging. In a party of 6 characters in the 1-2 subtier (I was the only level 3 character, and a brawny cavalier at that), these burning skeletons could have wiped us off the map easily. The GM was kind to apply that the skelly's burning aura didn't apply to already unconscious characters. If that were the case, all but 2 of our party would have been wiped out of the beginning of round 3...pretty rough. First and foremost, I do not wish to play heavy space-techno-science adventures in fantasy RPGs I play in, but it seems that the whole of season 6 will be heavily inundated with science fiction themes. While I can appreciate the fiction and the writing of the sub-genre, in a living campaign it seems unfair to force one theme on all of an entire year's worth of play. I totally understand that season 5 scenarios didn't all have demons in common, nor season 4 with the Runelords, but still. 6-01 juices you with so much space-babble it's nuts for a typical sword and sorcery gamer. Just my thoughts. I ran 4 slots of this at GenCon and I won't deny that it is tough, but I don't think it requires errata. Really there are three major encounters to worry about, and all of them become much better with good tactics. One of the common threads I saw when I ran this scenario was that players quickly adapted to all the encounters and while a party member may have gone down quickly, that's about all that happened. And honestly, if there are a bunch of new players at the table, it's our job as GMs to encourage these tactics. Every table got my "here's how gazes work" speech, and most tables also got my "friendly fire breaks fascinate" tip to encourage them to keep as much friendly actions as possible. 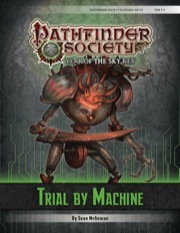 For the earlier encounters, when the party consisted of newer players, I emphasized that the machine soldier was stuck to the floor, and that was enough to get them to not stand next to it normally. Also all the tables I ran for split themselves up so the auras were spread out across the room and not ganged up on one person without any prompting from me. As for Season 6 and Technology, John Compton has already stated that Year 6 will have less Numeria stuff than Season 5 had demons. I wouldn't take Trial By Machine to be an example of how the rest of the year is going to be. My bad. I was looking at the full PDF tool, not the "reader". I got Nitro Reader and I'm now able to copy and paste into Gimp without the room/trap markings coming over. You're a life-saver. I played this at gencon and our DM was fantastic. In a group of 6 we had three completely new to pathfinder players. Two were running pregens (warpriest and sorcerer). There was one level 2 character (bloodrager). The others were a shaman, skald, and hunter. The skeletons were the toughest part. We had one character almost die but we got through it by the skin of our teeth. The room without oxygen was also a scary moment since it took half the health of most of us. Overall though everyone seemed to love the tech elements since it added such an element of suspense. You never knew what would be around the next corner. The difficulty added to that suspense...we were definitely all on the edge of our seats. At the end the new players all seemed interested in playing more. I thought the scenario was a huge success. I think it's kind of a jerky/bad DM move to let you go back to HQ and then end the scenario on you with no warning. At the very least you should be able to try and rest in the bunker room with all the beds to restore spells since you're not on a timed mission. I certainly hope the rest of season 6 isn't as brutal as this scenario was...played this last weekend at Dragoncon. we had a couple of veteran players and three players new to PFS. one was sitting in his first PFS game...needless to say the scenario was exceptionally difficult. our highest level character (level 3)was killed before he even got off a shot at the first creature we faced...in that same encounter two other members of our party were put down into negative digits and a animal companion was killed. The whole scenario was written like it was Bonekeep...not a 1-5. Sadly i think this scenario might have soured atleast one of the new players to not play any more PFS in the future. our table was playing the low tier...unless our GM was completely screwing us over...the encounters were not tier appropriate at all...it felt more like a 7-11. When I sit down at a 1-5...I expect it to be somewhat lighthearted...maybe some puzzles, knowledge checks, or diplomacy...and a couple of hack and slash encounters where unless you do something crazy or have horrible luck...the worst you can expect is maybe one teammate unconscious. If this continues i may just forego the rest of season 6. I liked it, and enjoyed the challenge. And was not the slightest bit surprised that trial by machine had a lot of machines in it. I had a minor problem when I printed this. When I printed page 9 on my laser printer (black and white), the red dashed trap area was almost impossible to see. Given the time gap between when I read the PDF and drew the maps out, I didn't remember that there even was a trap zone shown on the map. We got along fine - I just drew an area that was 20 feet from the archway, though it was larger than the one drawn in the scenario, so tactics were a little cramped for the players (until they decided to just brave the darts). Hmmmm, played this Saturday with a group of 5 other 1st levels. I was the only 2nd level. Gorum was with me ane we were victorious, although our blood ranger was almost killed by the strange skeletons. In our toughest fight, a 40 point critical was more than enough to kill it. "all praise to Gorum"
Or in other words, fun, tough, but hardly bone keep. We had a wizard 1, cleric 1, cleric 1, warpriest 1, bloodrager 1 and warpriest 2 (me). Playing this tonight, and haven't settled on a PC yet. I don't see any factions mentioned as being associated with this one. Are there faction mission(s)? This scenario furthers the Silver Crusade faction storyline. Would this scenario work as a "pre"-Fires of Creation adventure? Since the campaign presumes that the heroes start as a party, I was wondering if this would be a good intro. One of more of the characters is MUCH more likely to have the technologist feat. The technological treasures found in this adventure are much less likely to be unbalancing to the campaign. I think that could work rather nicely.